1 oz. individual serving size, sealed cup. 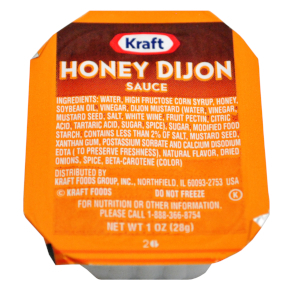 Ingredients: water, high fructose cron syrup, honey, soybean oil, vinegar, dijon mustard (water, vinegar, mustard seed, salt, white wine, fruit pectin, citric acid,t artaric acid, sugar, spice), sugar, modified food starch. Contains 2% or less of: salt, mustard seed, xanthan gum, postassium sorbate and calcium disodium EDTA (to preserve freshness), natural flavor, dried onions, spice, beta-carotene (color).